Fr. 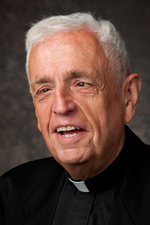 Larry Gillick, S.J. gave this wonderful talk on Shame. It can be a great help to all of us who seem to devalue ourselves, who tend to not feel that anything about us is good enough, who struggle to accept ourselves and let God love us. Fr. Gillick helps us understand what spirituality is, what prayer is, and how we can let a huge weight be taken off our shoulders, just by being who we are. This talk is just over one hour. It can be listened to online, downloaded and listened to off line, or burned to a CD to listen to in the car, or on our mp3 players or smartphones. It can be a great gift we can give to ourselves and it could be an important gift to a friend or loved one. Click on the icon below to listen to the talk. To download the audio file, simple RIGHT CLICK on the icon and choose, "Save Link As ..." and choose where you wish to save the file. It might then be burned to a CD or saved to an mp3 player, iPod, iPad, iPhone, or other smart phone.